Pallet Racking Systems in Dubai: Mobile Racking and Shuttle Racking Supplier in Dubai, UAE. Still the most common form of pallet racking storage: The standard pallet racking layout provides unrestricted access to all pallets. Pallets stored in wide aisle racking are freely accessible at all times. Pallet racking can be configured in a variety of ways and systems, depending on the customer’s requirements and pallet load. Available in heights of up to 30 meters and varying depths and widths, the Dexion P90 racking will perfectly fit into the space available and is suitable for all kinds of pallets – Euro, disposable or captive pallets, mesh boxes or bins. Narrow Aisle pallet racking is the space-saving option if floor space is limited: maximum storage capacity, fast accessibility to every pallet and quick order-picking straight from the racking. Warehouse capacity can be increase by an additional 40% over Selective Pallet racking by increasing operational height and the reduction of operation aisle. Specially designed Narrow Aisle trucks or cranes are required, to allow maneuvering in the narrow aisles between racks. Handling equipment is often highly automated, and guide by wire or rail. Drive-in racking is suitable for goods that can be stored on pallets behind or on top of each other, but ideal when greater access is required compared to block stacking. Pallets are stacked by the first-in, last-out (FILO) principle on supports mounted on both sides of the drive-in channels. This means that individual pallets cannot be accessed directly, but one by one from the front of the rack. Drive-in racking systems significantly increase the storage density in a warehouse. Dexion drive-in racking provides a safe and efficient equivalent of block stacking for loads which are too fragile or unstable to be stacked on top of each other. This type of structure offers an improved utilization of space than a traditional mezzanine floor arrangement. Multi-tier pallet racking is ideal for cartons, boxes and garment storage. 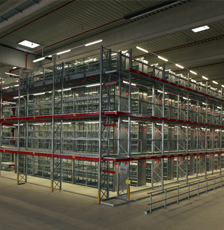 This type of pallet racking structure creates a number of levels and walkways for storing and collecting goods. Combining mesh or steel shelves the solution offers an increased number of picking levels. Utilizes the full height of the building. Allows order picking on multiple levels. Can combine pallet storage and small goods storage. Removes the need for a mezzanine floor. MOVO, the mobile pallet racking is the optimal solution for storage, providing dense pallet storage and helping to reduce costs for a new building or the possibility to better utilize existing warehouse storage space more efficiently. The electronically controlled MOVO heavy duty mobile pallet racking system runs on embedded rails and can carry bay loads of up to 24 tons at racking heights of up to 12 meters, with runs up to 90m possible. MOVO is suitable for any kind of warehoused goods and with a guaranteed operational safety at temperatures as low as -30° C it makes it ideal for use in cold storage rooms. Shuttle Pallet System is a semi-automated storage solution for the handling of goods inside channels similar to a drive-in setup. The Pallet Shuttle System removes the need for forklift trucks to enter the aisles and hence offers a cost effective and time saving storage solution. Pallet Shuttle System is a semi-automated storage solution for the handling of goods inside channels similar to a drive-in setup. The pallets are placed on a Pallet Shuttle (a battery powered pallet cart) which carries the pallets into the rack. All handling of the goods within the channels is carried out using the Pallet Shuttle which is remotely controlled by the user. Push-Back racking provides high-density live storage where quick and easy access to loads is required within your warehouse. Pallets are loaded into the system on telescopic trolleys (carts), each trolley being pushed back into the rack by the incoming pallet. Pallets can be stored two, three or even four deep. Pallets are loaded and unloaded from the same aisle face, which reduces truck travel distances, and cuts cycle times. Push-back can also be used to provide additional storage space in otherwise unusable areas such as above cross-aisles or around dock levelers. Pallets are automatically presented at the rack pick face. Accessible by Last-In, First-Out (LIFO) principle. Pallet Flow racking, otherwise known as Pallet Live Storage, is suitable for FIFO (First In First Out) storage of goods with a high rate of turnover and fast access to goods is required, but utilizes up to 60% less space than a conventional pallet racking warehouse. Pallet Flow racking system is mainly used when a limited range of palletized goods needs to be stored in large quantities using the first-in, first-out principle. At the on-load face, pallets are placed in storage lanes and automatically roll forward on sloping wheel conveyors under the force of gravity.